Due to the construction of a tramway maintenance center on its site, the northern part of the Jules Ladoumègue sports center has been redesigned by Dietmar Feichtinger Architectes. The site is bordered by a canal to the north, the Parisian ring road to the west and the tramway to the east. 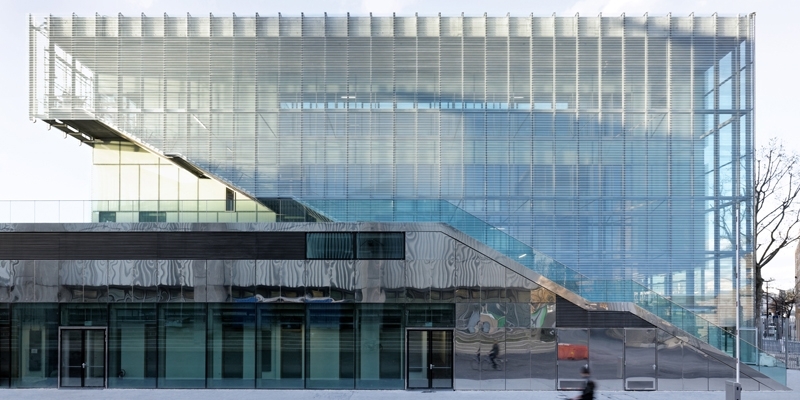 Sports fields for soccer and rugby are on the extensive flat roof of the new RATP maintenance center, and are accessed from street level via an external monumental stairway at the south-east corner of the site. This is part of a new building housing changing facilities and sports halls and signaling the center�s new entrance. To the south is the existing Pagoda gym. On the west boundary is a 200m long building comprising six covered tennis courts, which provides a visual and acoustic barrier to the ring road. The tennis building is cladded with cellular polycarbonate panels, alternating red and colorless to hint at the keys of a piano because the City of Music in on the far side of the boulevard. Fixed horizontal timber solar shading screens the east facade; the other facades have adjustable vertical lamellas to increase or decrease solar gain as desired. On the signal building too, fixed and adjustable lamellas control passive solar energy gain. The variation in their angles creates an effect of animation and lightness on the building. Opaque sections of wall define internal function: the opaque walls of the gym and squash courts feature polished and pleated stainless steel paneling. The basement climbing area has a separate entrance on the south facade, with changing facilities on the ground floor, and a lift and a staircase descending six meters below street level provide access. In the main entrance hall there is a lift to all levels and access to a main staircase whose lower flights mirror those of the external stairway. The multipurpose hall is located on the second floor, and its changing facilities can be reached by two entrance halls reached directly off the main staircase: one on the second floor, the other on the third, at the level of the grandstand seating. The fourth floor is organized around a timber-floored patio accessible to sports center users, offering an external meeting point and a rest and fitness area. At this level are located a clubhouse, dance hall, a gym, a fitness room, as well as squash courts. Taking advantage of the volume created by different hall heights, the janitor�s flat is located on the fifth floor.